Corns and other foot pad lesions: an injury that owners often don’t know about. These include burns, scrapes, calluses, and corns and can be very painful for dogs. Signs of this injury include licking the paw excessively. 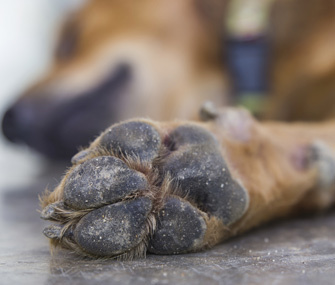 It’s especially important to be aware of these injuries because dogs’ paws are often in the dirt and the injury can become infected. 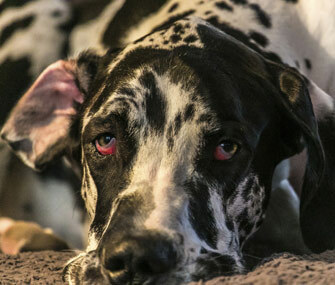 Panosteitis: AKA “growing pains.”This is especially common in large and giant breeds (like Belle and Luka who are the mix between a large and giant breed). Some dogs, according to Dr. Patty Khuly, “are remarkably stoic and show no evidence of pain save a quieter demeanor.” An x-ray or two may be needed to confirm the diagnosis. Corneal ulcers: Dogs may display a bloodshot eye, squint, have some discharge, or paw at their eye. An eye exam is required to diagnosis after which the dog may need medication to help with the issue or a trip to the OR. Luka, one of my Labernards, actually has an eye deformity which is causing this issue and will be going to the OR at the end of the month to have both of her eyes operated on. Disk disease: Dogs with disk disease have trouble walking and may drag their rear. X-rays may be needed to definitively locate the problem. Some dogs can be managed with anti-inflammatory medication, rest, and/or muscle relaxants, but some severe cases require emergency surgery. Tooth fractures and dental disease: Symptoms include redness and inflammation where the teeth meet the gums, buildup on the teeth, and loose, discolored, or missing teeth, difficulty chewing and bad breath. It can be just as painful for dogs as it is for humans. Otitis: A severe ear infection which stems from a mild one. It is often treated with anti-inflammatory medications and antibiotics, but another cause is often allergies. From my own experience, this is very common for dogs with floppy ears (like Belle and Luka) because the ears cover the inside of the ear which gets wet and breeds bacteria. These issues are not all related to agility, and, as I learned in my interview with Sally Gichner, most agility dog injuries don’t actually happen in the ring. In the article, Dr. Patty Khuly uses hyperlinks to link to more articles on VetStreet which further explain: what to do if your pet is limping, x-rays, pet anatomy, and each of the seven common injuries. Whether your dog is involved in sports or just likes to run around the house these are important signs to look for. Dr. Patty Khuly practices medicine in Miami, FL. She has been blogging for nearly six years. She holds a BA from Wellesley College, a Veterinary degree from UPenn, and an MBA from Warton School of Business.